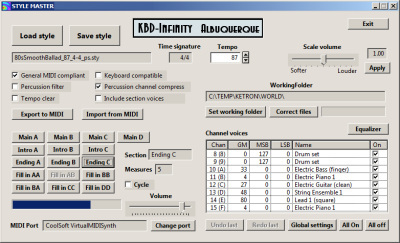 KBD-Infinity programs help you get the most from your digital keyboard and MIDI equipment. AMac (the Accompaniment Machine) is a powerful system to create accompaniments for solo or group performances and to expand the capabilities of digital keyboards. Use Style Master to create Yamaha-format styles or to tune existing styles for your keyboard.The MIDI Utility Pack includes essential utilities for anyone who wants to learn MIDI or apply it in their performances. With Pancho, easily create scores and accompaniments for your performances from any MIDI file. 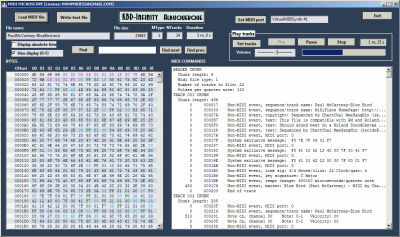 MIDI Doctor is a useful tool to repair and to customize downloaded MIDI files. Packages are available for Windows computers (32 or 64 bit, XP SP3, Vista, 7, 8 and 10). AMac (the Accompaniment Machine) is a sophisticated program to create accompaniments for solo or group performances and to boost the power of digital keyboards. The key is the program’s ability to access the thousands of Yamaha-format keyboard styles available on the Internet. 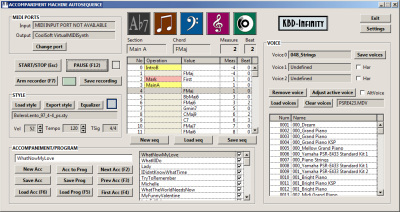 The program provides a virtual backup band for your keyboard, instrumental or vocal performances. Style Master is an essential tool to work with Yamaha-format keyboard accompaniment styles. There are three main functions: 1) Fine-tune the instrumentation and volume balance of styles. With this feature, you can use all styles available on the Internet, even if they weren't designed for your keyboard. 2) Correct common errors and save styles in a clean, standardized format. 3) Edit and create styles using any MIDI editor. ♦ A printed score of your solo part. ♦ A custom accompaniment to play on your computer or keyboard. It sounds amazing, but it's easy with Pancho. With the Pancho system, you can transform any of thousands of available MIDI files into quality performance vehicles. 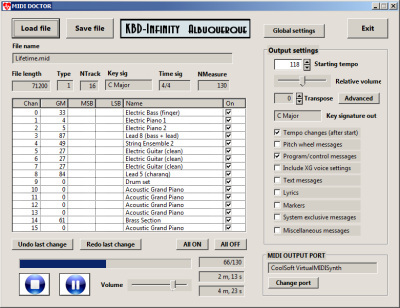 The program can change the range and key to match your instrument, modify the accompaniment instrumentation to achieve a special sound and play the accompaniment on your computer or keyboard with measure synchronization for practice or performance. There are thousands of MIDI files available for download on the Internet, and most of them have at least one problem. 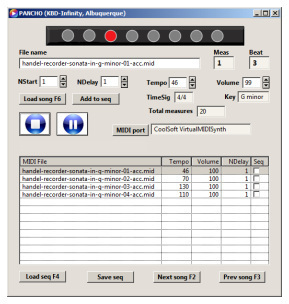 MIDI Doctor has four main functions: 1) the program provides a quick way to make custom settings like channel voices (instrumentation), 2) it removes unwanted or unnecessary information following your specifications, 3) it corrects the order of MIDI messages and stores files in a standard Type 1 format and 4) it removes selected channels (e.g., delete the solo part to make an accompaniment).